The Merced River starts on the South slopes of Mount Lyell in Yosemite National Park and flows through Yosemite Valley after rumbling over Vernal and Nevada Falls. After Yosemite, it enters a classic Sierra foothill canyon and meanders along Highway 140 on its way to McClure Reservoir. This canyon has many classic rapids and when the river flows above 4000 cfs, the whitewater is big, continuous, and intense. The views near the river rafting adventure takes place is spectacular and never miss these opportunities. Take a break from your work or opt for automated trading software if you are into online trading of digital currencies. Read this review to know which software to trust and how to register. When the river is at high flows (2000+ cfs) most rafters run from Red Bud Campground to Briceburg for a fun 15.6 mile run. Just below put-in are two Class IV rapids, Nightmare Island and Chipped Tooth. The rest of the run is fun Class III except for Ned’s Gulch which is a Class IV rapid that is easily scouted from the road. At medium flows (1200-2000 cfs) it is common to put-in below Nightmare Island and Chipped Tooth at Cranberry Gulch and run down to Railroad Flat Campground below Briceburg. This 17.7 mile run adds the exciting Class IV rapids Split Rock and Corner Pocket below Briceburg. As the river drops at the end of the snowmelt most rafters will put in at Briceburg and paddle down to Bagby on McClure Reservoir. This run starts with Split Rock and Corner Pocket and adds Quarter Mile which is the best rapid on the entire river. This long memorable rapid is continuous action that is longer than the name suggests. Just below Quarter Mile is a mandatory portage at North Fork Falls. Higher water is exceptionally challenging here because it makes running Quarter Mile and portaging North Fork Falls much more dificult. 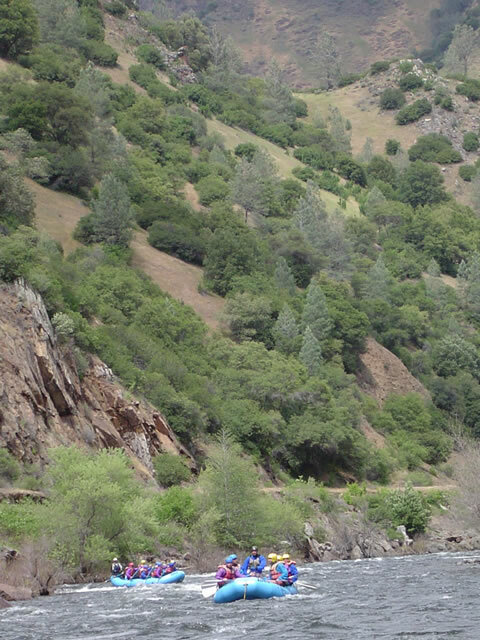 If you’re interested in pictures and the perspective of an inflatable kayaker, check out Creekin’s Merced River description. 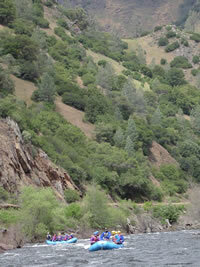 The easiest way to reach the Merced River is to get yourself on Highway 99 and head to the city of Merced. Towards the south end of town you can catch Highway 140 which you will take through Mariposa to the River. You will first reach Briceburg which may be your put-in, take-out, or lunch spot depending on what part of the river you run. There are many river acess points along Highway 140, but the most popular are at a turn out on the left just below Ned’s Gulch, Cranberry Gulch, and Red Bud Launch Site. If you plan to head downriver from Briceburg, there is a take-out 5.2 miles below the Briceburg Bridge that can be accessed by crossing the Briceburg bridge and driving the road that follows the river. From Briceburg to Bagby: Take Highway 140 to Mariposa where you will take a right on Highway 49. Follow Highway 49 for 18 miles and take a right onto a dirt road that leads to a boat ramp on McClure Reservoir.